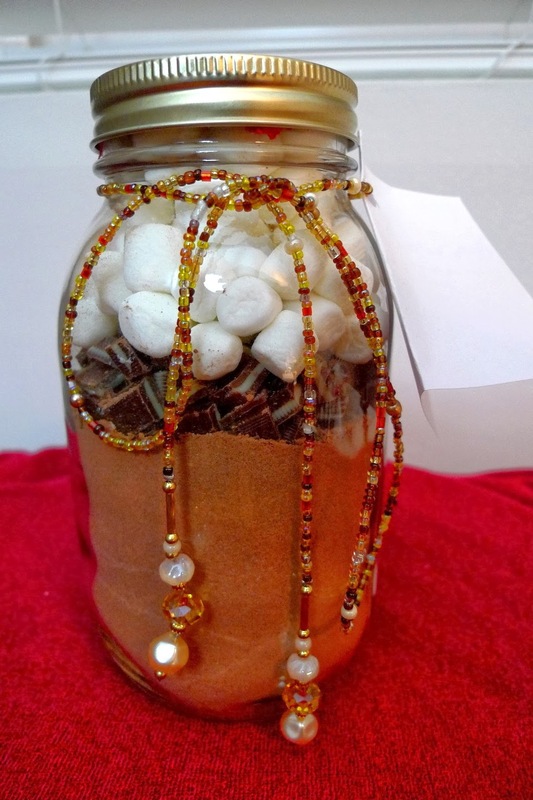 What with the weather getting colder, it's definitely reaching hot cocoa time. Not to mention, it's also Christmastime and I love making treats to give to all my friends. So, when I saw this Peppermint Crunch Hot Cocoa Mix featured on the Secret Recipe Club, I just knew it would make the perfect gift. I did a little taste-testing with it and, as a result, changed the recipe up a little. I left out the cinnamon and increased the cocoa powder by half to make it more chocolatey. Also, I used Andes mints instead of the peppermint crunch. The result was the most delicious hot cup of cocoa I've ever had that did not come out of a Swiss Miss box. 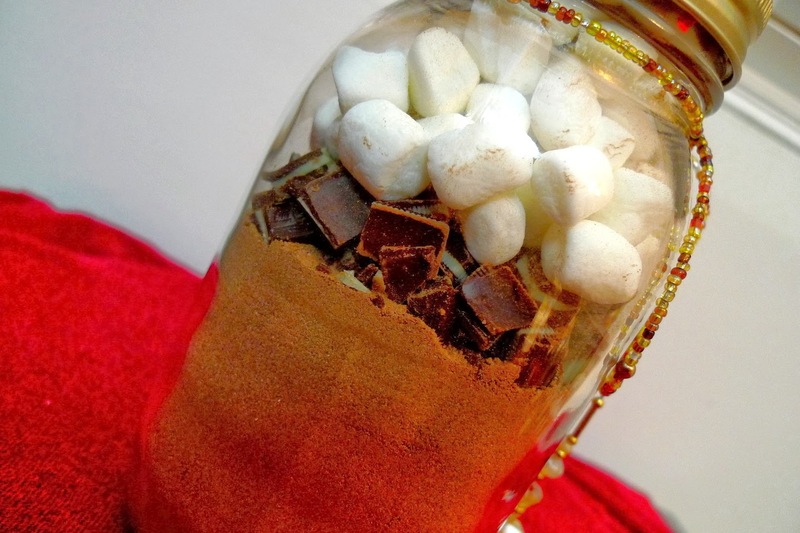 Who in the world knew that making cocoa mix could be this easy? Okay, fine, I'm sure you all knew, but it was a real eye opener for me. While I can't say that I'll never buy my cocoa from a grocery store again, I do know that I'll be keeping some of this on hand, at least during the holidays. I also have no doubt that the person I give this to is going to love it as much as I did. If you're using a more granular type of dry milk powder (see Note below), run it through a sieve to break up the lumps. Combine the dry milk powder with the sugar and cocoa powder and whisk to combine. I also like to run it all through a sieve. Layer the cocoa mix into jars with the chopped Andes mints and the mini marshmallows. To make: Combine 1/4 cup of the mix with 3/4 cup of hot water. Note: If you buy the Carnation brand of instant dry milk, the powder is much finer. If you buy the Wal-mart brand of dry milk, it'll be more granular and you'll have to break up the lumps. With Christmas coming up, I know my family will be wanting to have green bean casserole. I, on the other hand, like my green beans to be fresher, lighter, and healthier (i.e. no creamy soup, fried onions, etc.). 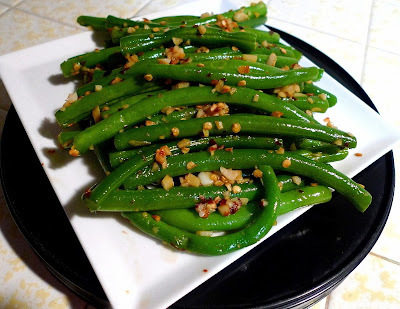 So, the idea of green beans that are dressed up with only garlic, lemon juice, and chili pepper (my favorite) totally appeals to me. Which is why I had to try this recipe out after having my eye on it for so long. I love that they're so quick to make - just a couple minute blanch in hot water and then saute everything all together. What surprised me was that the garlic wasn't overpowering at all (even with six cloves of it). I did end up cutting the amount of chili flakes in half and it was more than enough to give it that kick. All in all, I ended up with a dish that was tasty, healthy, and full of beautiful bright color. Maybe I can convince my family to forego the green bean casserole with this recipe. One can hope. Bring a large pot of water to a boil. Add the green beans and cook for 2 minutes. Drain the green beans and set aside. In a large heavy bottom skillet, heat the olive oil over medium high heat. Add the garlic and red pepper flakes and sauté for 2 minutes until the garlic becomes fragrant. Add the green beans and mix everything together, making sure the garlic is evenly distributed amongst the green beans. 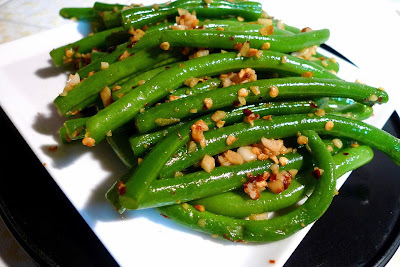 Squeeze a little lemon juice over the green beans and enjoy. Have you ever seen Leigh's blog, Chit Chat Chomp? It's got such a warm, homey, comforting feeling to it. Looking at the pictures of all the delicious things she makes, you just can't help but sigh in contentment and happiness. I definitely had fun looking through her recipes. I just love the holiday season. The pretty lights, the cheerful music, and, of course, the treats with their seasonal spicy flavors. That's why I picked her Crunchy Ginger Slice for this month's SRC. 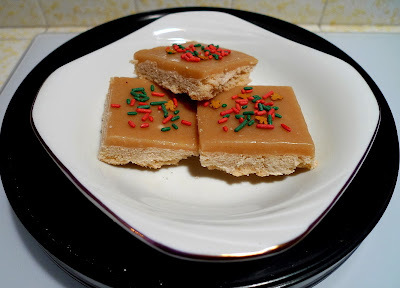 They are perfect for this time of year - minimal ingredients, super quick and easy to throw together for any party, and the gingery flavor just has Christmas written all over it. The only change I made was to increase the amount of ginger powder in the cookie base. Also, since I didn't have any golden syrup, I substituted with a 50/50 mixture of light and dark corn syrups. I think the icing was the best part of these cookies. I don't even know how to describe it. 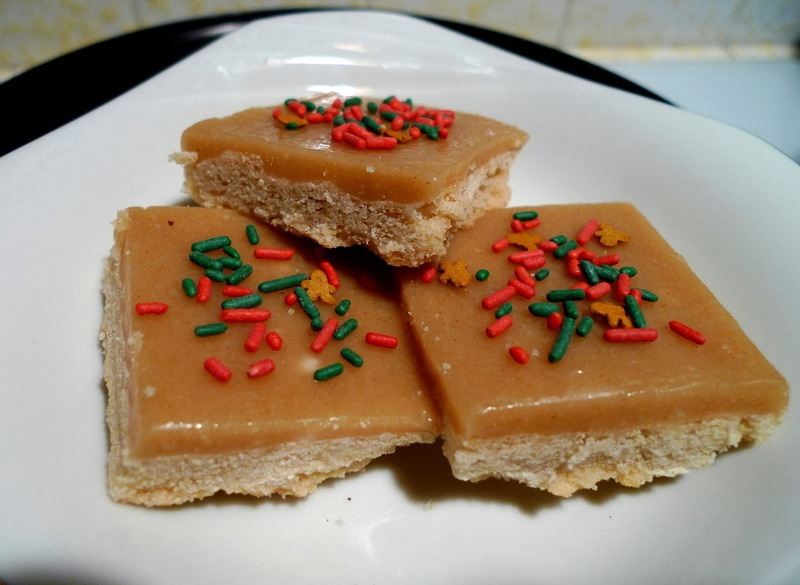 It's like a ginger candy/caramel that's sweet and sticky, but melts in your mouth. Simply lovely. I dressed up the finished bars with some Christmas-y sprinkles and now they're all ready to share with my friends. Thanks Leigh for a sweet holiday treat! Preheat oven to 350F. Cream the butter with the sugar. Add the flour, ginger powder, and baking powder and mix until well combined. Press the mixture into a parchment paper-lined 8x8 pan and bake for 35 min., or until golden and firm to the touch. Set aside. To make the icing: Place the butter, corn syrups, and ginger powder in a saucepan over medium heat and cook for 2-3 min., or until butter is melted. Add the powdered sugar and whisk to combine. Pour icing over the cookie base. Chill for 1 hour or until set.